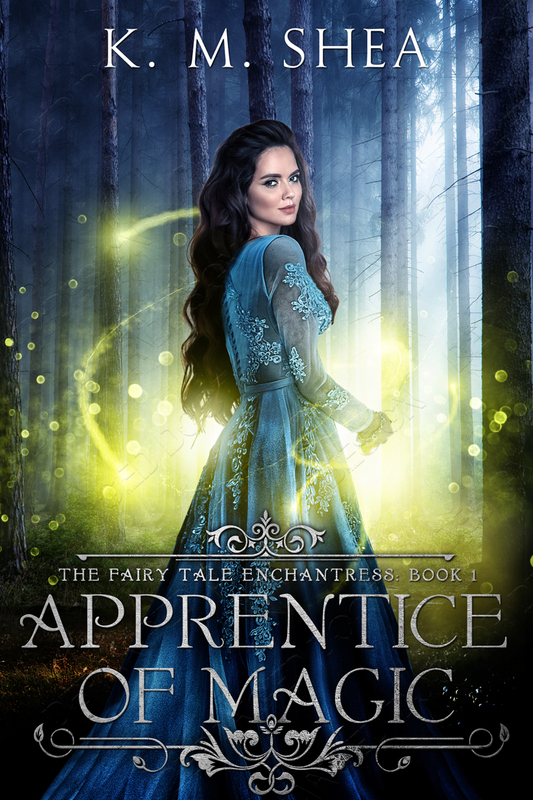 Apprentice of Magic – Angelique’s Book 1 is here! It’s here! I’ve been waiting years to tell Angelique’s story and the first book. Apprentice of Magic, is finally, almost here! It’s up for pre-order now but it will drop February 13th! Angelique is actually what inspired me to originally write the Timeless Fairy Tale series. I thought it would be interesting if the seemingly different magic user/fairy godmother/enchantress from many different fairy tales was all the same person. This is why even though the Timeless Fairy Tale books are mostly stand alone, Angelique and the thread of her journey can be found in all of them. Now it’s time for Angelique to have her own series! This new series will eventually tie up all the continent wide plot points left from the Timeless Fairy Tales series, but this book covers Angelique’s adventure prior to you meeting her in Beauty and the Beast. If you’ve been wondering why Angelique hates her magic and how she got started on the search for her master, Evariste, this is the book you need to read! There she is! This is actually the first photo-based cover Myrrhlynn didn’t make for me, but she still helped me figure out what important design elements we needed to include. I hope you guys like it! And as usual, as my big thank you I’ll be running my review special! 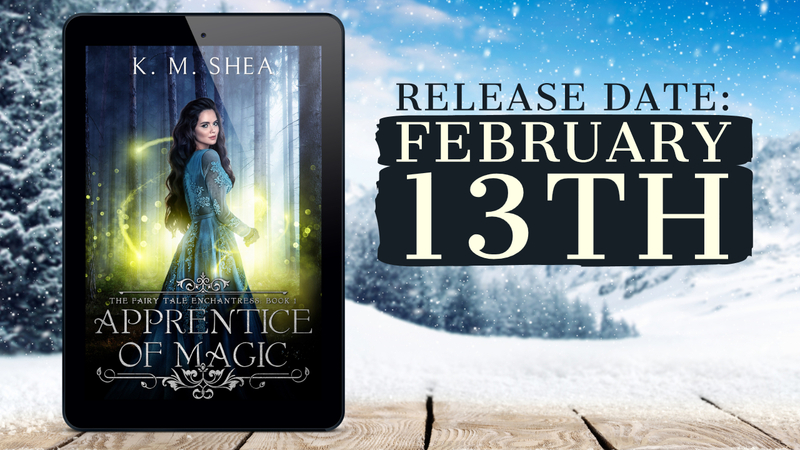 There’s only one short this time–because it’s actually a quite long extra/bonus scene–but I’ll post more information about it once Apprentice of Magic launches! Has blonde hair, mismatched green and blue eyes with a fascination for hoods. His looks aren’t much mentioned in TFT except his eyes and the fact that he is handsome. Apprentice of magic clocked at 85 reviews at amazon.com. Not much longer until we get to read the short! 87 now! Three more to go!! 88 now! 2 more to glory! Having now read the book twice, I am starting to re-read all of the other ones in order. I feel like I can appreciate the first books even more! Can’t wait until I can read Angelique’s POV side by side with the other ones. This got me thinking a crazy thought. It would be so much fun if, once finished, all the books in the series could be compiled into one large book in chronological order of how things take place. This would be a monumental undertaking and probably confusing to anyone that hasn’t read the books several times since we would be jumping from one character to another so quickly. Still, it would be so interesting! I think I will probably just have to settle with reading them in chronological order myself. Seriously has anyone else noticed that Clarus and Sarthe aren’t on the map in Apprentice of Magic? Anyone? Anyone at all? I suppose they could just be not there at all. Kingdoms are always falling, aren’t they? It would be impractical to assume that every country is there after centuries. And we did get loire, the biggest country out there, it was probably made of these i guess. Yeah I don’t really remember Loire being mentioned in the Snow Queen series but how likely could it be that it’s that? I am positive lucien sometime said that loire was formed after the war of ice and snow. And from sarthe’s description it was on the southern border of verglas, much like loire. I thought it was a possibility considering how big loire is. Seriously, What happened to Clarus and Sarthe. Are they islands? Were they swallowed up by the sea? Are they floating in the air above the continent? WHAT HAPPENED TO CLARUS AND SARTHE? Your ideas though are very interesting. Wait, What happened to Clarus and Sarthe? They were both mentioned in the Snow Queen series but now that I think about it they weren’t mentioned in the Frog Prince at the Summit either. I know!!! The fact that he sees through her, but instead of calling her on it he finds it endearing and teases her, makes for a really adorable dynamic. I’m gonna predict he will win next year’s hero poll! Been waiting for this book to come out for ages and was not disappointed! Has the extra short been released already? No, i don’t think so. It will be out at 90ish reviews and so far its been 60 at amazon.com. Just finished it – and OH MY WORD, KITTY. YOU SO TOTALLY DELIVERED. This was everything I’d hoped it would be and I have no idea how I’m supposed to wait two whole months for the next book. I think we’re all in love with Evariste now. You could see that one coming for years, but it was so awesome to watch it play out. I wasn’t expecting her to be quite so oblivious, but it was HER feelings for HIM throughout the other books that first tipped me off, so I imagine she’s not nearly as unaffected as she would have us all think. I want to go back and read allllll the Timeless stories again now! I agree with everything you said. Can’t wait to read the whole thing with the loire duke. Its so nice that Evariste’s sense of humour makes him appreciate angel instead of scolding her for misdemeanour. Wohoo! It would be amazing if that happened. There is some serious competition there though with emerys and Merlin and possibly solus. The fact that the 2 more books releasing this year won’t feature him does nothing in his favour. Eleniel already asked this, but we don’t have an answer yet. Does Evariste have Farrin’s wolf statue? When he told Angelique to pay attention to how the light reflects off the stone [wolf statue], I just about jumped out of my skin with curiosity! I want to know too!! Amazing; I absolutely adored this book. Left reviews and everything already, can’t wait for the next one! Kitty, I hope you don’t mind possibly answering a few of the bURNING questions I have now, although I completely understand if you can’t due to future spoilers! Where/what country is Angelique from originally? All I remembered was just her mentioning a village, but not where or which country’s army that her father was in. Are we ever going to meet any of the people she knew before going to Luxi-Domus? Did any of the enchanters/enchantresses we meet (Evariste, Clovicus, Lovelana, Sybilla, etc.) choose their name, or do they all keep their birth name? I seem to recall something (can’t remember where) about how Angel told Stil that she was unique in keeping her birth name, so I was just curious about this. Lastly (and probably the most spoiler-y), why did the Headmaster tell the teachers to keep a close eye on Angelique? My suspicion is that whoever in the leadership at the Veneno Conclave is in league with the Chosen spotted Angelique as a threat right away, and that what looked like persecution was actually sabotage. Whether or not the headmaster was in on it or not is not clear to me. Btw, wasn’t Madam Quarrelous such an awful shrew?? It was SO GOOD to see Evariste finally give her what fer! I so agree. That was an amazing scene. Its too bad clovicus stopped Evariste from giving the headmaster a piece of his mind too. And when sybilla ticked her off…..my favourite fairy godmother! Sybilla is wonderful! I want her as my grandmother haha! Now, I LOVED it! I tried to go slow but couldn’t bring myself to really do it ^^; I finally have the full answer to what’s up with Evariste and Angelique’s relationship! I started with Puss in Boots(ironically appropriate for the timeline) so I’ve been contemplating this a WHILE. I’d started to get it by Snow White, but that book left me in no doubts of that it was romantic(potentially or otherwise at the time:) and I was wondering how. Knowing Evariste was a child prodigy explains a LOT. Angelique’s issues are now so much more clear. She’s got probably Rakal’s power levels and people fear her, but for very different reasons. I like the fact she wasn’t bullied so much as feared which is why she’s traumatized. Points to NOT underplaying the trauma that can cause or time it can take people to heal. I feel so bad for Evariste, he loves her but fears hurting her and struggles so hard find a balance. And then of course all the chances are ripped from them both for several years. Learning that the sharper side of her is the REAL Angelique was interesting. I thought her personality in Snow White was a disguise, but in truth it’s mostly the real Angel coming out at last. Poor thing. Seeing characters from the other books is so awesome, it binds everything together and makes relationship clearer now. I definitely grasp why Angelique and Stil were so adamant they weren’t interested in each other in Rumpelstiltskin. It’s honestly hilarious now I see their relationship from earlier. Lastly, I NOW get why Angelique was capable of beating the mirror by more or less just dumping MORE power into it. She has so much to spare for her at least it was possible. I’m also glad we don’t have to wait long, or I’ll drive myself mad(madder)with theories! Sorry if this post was long, I just had so much to say about the book! I know- it was impossible to but down! It’s so interesting to see interactions from other books where she seems so meek and get to see the calculation behind it. I also love that Evariste isn’t fooled by her act and delights in finding crafty ways to get around it. Yes Verlie it was long. I absolutely LOVED this story and I am so happy I only have to wait until April for the next one, any longer and I may have started to pull my hair out. Plus getting to see how they interact and more of Angelique’s personality is awesome. And poor Angel and Evariste it’s so sad that they had an argument and then he was taken. Oh my gosh, loved the book , loved snarky internal Angelique, loved sneaky conman Evariste, loved EVERYTHING!!!! I can’t wait until /April/ for the next book!! I almost died when they were studying illusions- does Evariste have Farrin’s wolf? I loved getting to see Stil and Puss before their books. I always wondered why Puss had a silencing collar -he would hardly willingly submit to wearing such a thing. If I had any complaints about the book, it would be that it ended. Time to read it again! I know! Me to! It was so awesome to see Puss and Stil when they were young. I laughed so much when I read this book. Though I wonder if Angelique will ever finish the evaluation of her magic. I think it is Farrin’s wolf. My theory is that he’s a descendent of Farrin and Rakel, which would totally explain why he has it. That would also explain why he gave farrin’s example to soothe angel. Its an awesome theory. And i want to see her evaluation too. She will probably establish a record or something. Though this might only happen after the war. Now she doesn’t have time for these things i guess. Maybe. I don’t know- in the Snow Queen series Kai and Rakel both come from regular parents, and Phile- whose father had magic- doesn’t have any, since mages can be born to anyone and children of mages aren’t necessarily magical. That would be so cool though! I am SO EXCITED about this – been waiting years to read this story! And the cover is beautiful!! Pre-ordered it the day it came out on Amazon! I really can’t wait to read about Angelique’s journey. And I really love that cover– great job! Only 1 day where i am! !